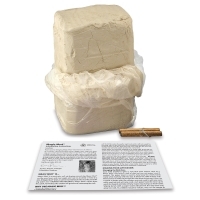 The Magic Mud Multi-Project Pack includes 25 lbs of soft air-dry natural clay, an 8" child-safe wire cutter, and a teacher's guide with lesson plans. Magic Mud is non-staining and cleans up easily. Air-dried objects can be turned back into mud again by breaking into small pieces and adding water! It can also be fired in a kiln and is non-toxic. Magic Mud Wire Cutter — This cutter's 3" hardwood handles are fastened to a child-safe, fine quality 8" stainless steel wire. It's for slicing and cutting clay. ® K-play is a registered trademark.® Magic Mud is a registered trademark.